Do you like discounts on stuff you buy at UC San Diego? A chemical engineer and a computer science undergrad from the Jacobs School think you do. 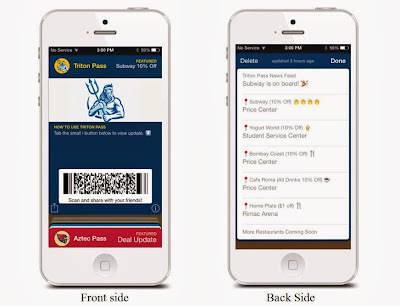 They built a virtual discount card for UC San Diego called Triton Pass. It’s free. Ford says they will soon be expanding to other universities. The iPassStore founders have gotten help on their business from the Moxie Center for Student Entrepreneurship here at the Jacobs School. Ford said the Moxie Center experience helped a lot in terms of setting up a business model and providing free work space. The Moxie Center is having an open house on Weds Oct 30, if you’ve got a business or invention idea that needs a boost. In its Global Data Cloud Index released Oct. 15, Cisco forecasts that global cloud traffic will grow 4.5-fold, a 35 percent combined annual growth rate, by 2017. Today’s data centers in which rows of servers sprawl over hundreds of thousands of square feet already consume some 30 billion watts of electricity, The New York Times reported last year. And this is all the more reason to rethink data center design and size so they require a lot less power and space, said two University of California, San Diego researchers in the Oct. 11 issue of the journalScience. Cloud computing is the fastest growing segment of data center traffic, approximating 1.2 zettabytes of annual traffic in 2012, according to Cisco’s annual report. Meanwhile, overall global data center traffic will grow threefold to 7.7 zettabytes by 2017. Cisco provides a little social math to illustrate just how much data traffic we’re talking about. 107 trillion hours of streaming music -- about 1.5 years of continuous music streaming for the world’s population in 2017. 19 trillion hours of business web conferencing -- about 14 hours of daily web conferencing for the world’s workforce in 2017. Graduate student Qing Gu at work in the Fainman lab in the ECE dept. at UC San Diego's Jacobs School of Engineering. In their commentary, electrical engineer Yeshaiahu (Shaya) Fainman and computer scientist George Porter proposed replacing the racks and racks of servers in today’s data centers into a single chip. “These ‘rack-on-chips’ will be networked, internally and externally, with both optical circuit switching to support large flows of data and electronic packet switching to support high-priority data flows,” Fainman and Porter write. Fainman is professor and chair of the Department of Electrical and Computer Engineering, and Porter is a research scientist in the Center for Networked Systems at UC San Diego Jacobs School of Engineering. Their proposed solution will require several significant technology advances. The most significant are how to network all the individual processors on a single chip as well as how to network multiple rack-on-chips to each other, said Porter. “To handle Big Data processing and data-intensive applications, you've got to have an enormous amount of network bandwidth, and we're developing new technologies to deliver that bandwidth cheaper, with less power and heat, and in a smaller form-factor than existing approaches,” Porter said. 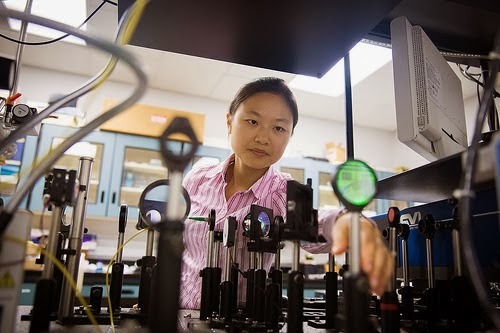 Fainman’s lab has been developing several aspects of the dense integration of electronics and photonics and nanophotonic technology required to achieve this vision in collaboration with several other universities as part of the Center for Integrated Access Networks. Fainman’s lab last year built thesmallest no-waste laser to date, a significant step needed to enable future computer chips with optical communications. Their breakthrough was reported in the journal Nature. This talk explains how the confluence of cloud computing and Massive Open Online Courses (MOOCs) have allowed us greatly to improve both the effectiveness and the reach of UC Berkeley's undergraduate software engineering course. The first part of the talk is motivated by Industry's long-standing complaint that academia ignores vital software topics, leaving students unprepared upon graduation. Traditional approaches to software development are neither supported by tools that students could readily use, nor appropriate for projects whose scope matched a college course. Hence, instructors traditionally lecture about software engineering topics, while students continue to build software more or less the way they always had, in practice relegating software engineering to little more than a project course. This sad but stable state of affairs is frustrating to instructors, boring to students, and disappointing to industry. Happily, cloud computing and the shift in the software industry towards software as a service has led to highly-productive tools and techniques that are a much better match to the classroom than earlier software development methods. That is, not only has the future of software been revolutionized, it has changed in a way that makes it easier to teach. UC Berkeley’s revised Software Engineering course leverages this productivity to allow students to both enhance a legacy application and to develop a new app that matches requirements of non-technical customers. By experiencing the whole software life cycle repeatedly within a single college course, students actually use the skills that industry has long encouraged and learn to appreciate them. The course is now rewarding for faculty, popular with students, and praised by industry. The second part of the talk is about our experience using MOOCs to teach Software Engineering. While the media's spotlight on MOOCs continues unabated, a recent opinion piece expresses grave concerns about their role ("Will MOOCs Destroy Academia? ", Moshe Vardi, CACM 55(11), Nov. 2012). I will try to bust a few MOOC myths by presenting provocative, if anecdotal, evidence that appropriate use of MOOC technology can improve on-campus pedagogy, increase student throughput while raising course quality, and even reinvigorate faculty teaching. I'll also explain the role of MOOCs in enabling half-dozen universities to replicate and build upon our work via Small Private Online Courses (SPOCs) from EdX and our electronic textbook. 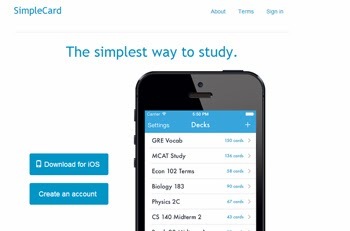 I conclude that the 21st century textbook may prove to be a hybrid of SPOCs and Ebooks. Biography: David Patterson is the Pardee Professor of Computer Science at the University of California at Berkeley, which he joined after graduating from UCLA in 1977. Dave's research style is to identify critical questions for the IT industry and gather inter-disciplinary groups of faculty and graduate students to answer them. The answer is typically embodied in demonstration systems, and these demonstration systems are later mirrored in commercial products. In addition to research impact, these projects train leaders of our field. The best known projects were Reduced Instruction Set Computers (RISC), Redundant Array of Inexpensive Disks (RAID), and Networks of Workstations (NOW), each of which helped lead to billion dollar industries. A measure of the success of projects is the list of awards won by Patterson and as his teammates: the C & C Prize, the IEEE von Neumann Medal, the IEEE Johnson Storage Award, the SIGMOD Test of Time award, the ACM-IEEE Eckert-Mauchly Award, and the Katayanagi Prize. He was also elected to both AAAS societies, the National Academy of Engineering, the National Academy of Sciences, the Silicon Valley Engineering Hall of Fame, and to be a Fellow of the Computer History Museum. The full list includes about 35 awards for research, teaching, and service. In his spare time he coauthored six books, including two with John Hennessy, who is President of Stanford University. Patterson also served as Chair of the Computer Science Division at UC Berkeley, Chair of the Computing Research Association, and President of ACM. For more information, please contact the Chair's Office at (858) 822-5198 or cse-cc@eng.ucsd.edu. Computer science student Simona Rosenberg sporting Google Glass, with Megan Smith, the VP of Google[x]. 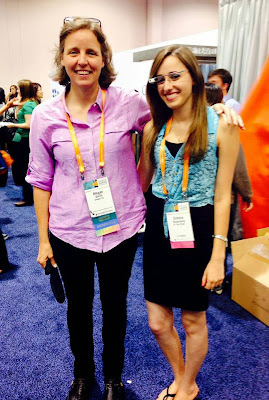 They rubbed shoulders (and got their picture taken) with the likes of the senior vice president of knowledge at Google, Alan Eustace, and Megan J. Smith, vice president of Google[x], the company's division that develops leading edge products, including Google Glass. 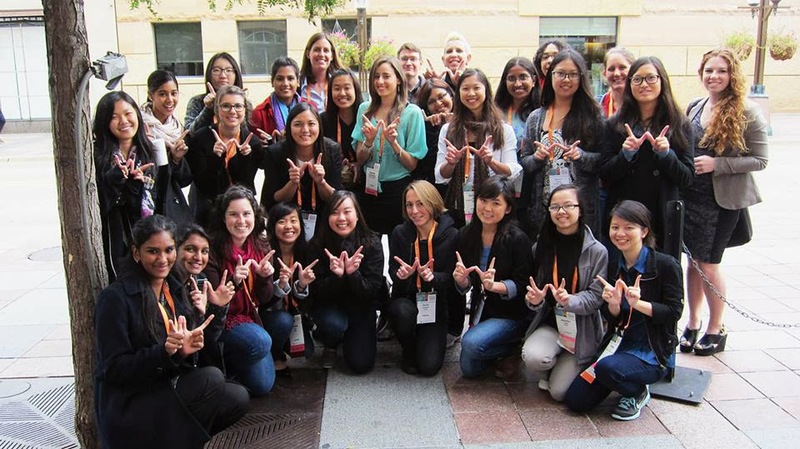 A large group of UC San Diego students and alumni attended the Grace Hopper Celebration of Women in Computing Oct. 2 to 5 in Minneapolis. In fact, UC San Diego was in the top 10 schools for the number of students registered for the event. Many of them were there to cheer on Christine Alvarado, a computer science professor at the Jacobs School, who received an award for her innovative teaching practices to attract girls and women to math, computing and engineering. 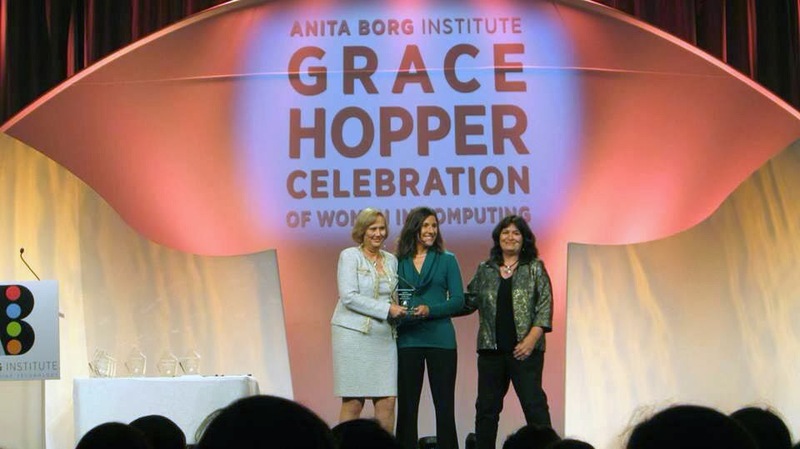 Alvarado received a $5000 prize from the Anita Borg Institute. The prize and award are named for A. Richard Newton, the former dean of the College of Engineering at UC Berkeley. Christine Alvarado, a computer science professor at the Jacobs School, receives the A. Richard Newton Education Award at the Grace Hopper Celebration. Alvarado received the award for spearheading the implementation of practices that changed the culture within the department of computer science at Harvey Mudd College, where she taught before joining UC San Diego. The practices led to a dramatic increase in the number of women studying and pursuing careers in computer science. More than 40 percent of Harvey Mudd computer science students are women--the highest percentage in the nation, according to the Anita Borg Institute. Thank you for WIC@UCSD for sharing their pictures of the event! 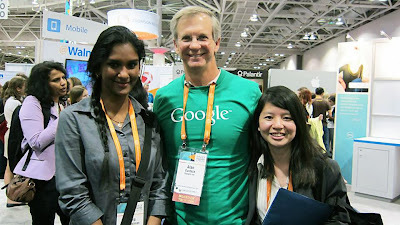 From left: Meera Ramakrishnan, Google senior VP of knowledge Alan Eustace and Huang Li. The two Jacobs School students are officers in the WIC@UCSD student organization. Students from WIC@UCSD at the Grace Hopper Celebration. 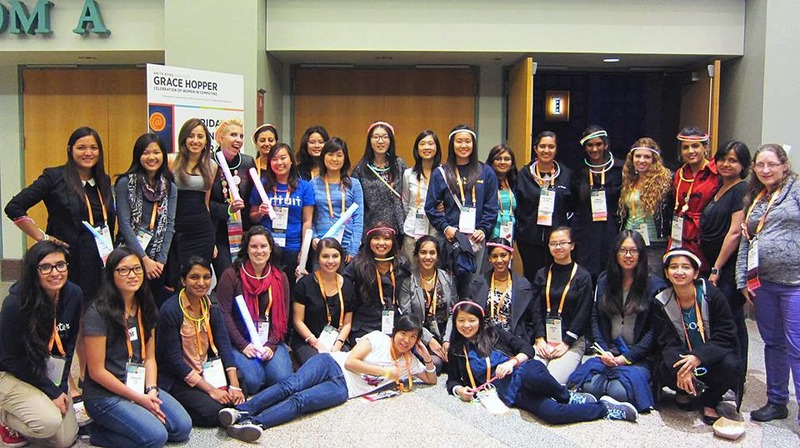 Jacobs School students and alums at the Grace Hopper Celebration. Photos from the Engineers on the Green event from Sept 30 at the UC San Diego Jacobs School of Engineering are on the Jacobs School Facebook page.